Not too long ago, I posted an article about the "Old Geezers" in Ufology. A critic had suggested it was time for the old guys to get out of the way because we had failed to solve the riddle of the UFO. Once before he had suggested it was time for us all to die because we were inhibiting the younger, smarter, more rational researchers. I suggested that we had, in fact, solved the riddle of the UFO proving that some UFOs were extraterrestrial in origin, meaning here that they were under intelligent control. Paul Kimball and Lance Moody suggested I might have overstated the case and that we hadn’t proved it. First, permit me a short digression. I wonder why things must always take a nasty turn. Why suggest that someone will be happy when we all die? Why take what I would term a civil discussion and turn it nasty? Why can’t we all agree that we’ll not accept some things the other side says without suggesting something about parents and thought processes? Why not realize that I have sometimes read the various arguments and reject them... not that I’m unaware of them, but because they do not persuade me. And I direct none of this at either Paul or Lance, two gentlemen who have argued with me about some of the things I have said or published in the past. I have had some very interesting and satisfying personal discussions with Paul, both online and in person. I do not know Lance personally, but his postings here have always struck me as well reasoned and well intentioned. Certainly not the nasty ones that have appeared elsewhere. As I say, they disagreed with my statement that some UFOs are intelligently controlled alien spacecraft. To them, if I understood their arguments, the evidence was not persuasive. They wanted more. Lance, I believe, suggested that my understanding of the scientific method and scientific thought left something to be desired. I believe he objected to my suggestion that there is a level of repeatability in UFO landing trace cases. Let’s take a look at some of this. I know that I have one piece of information that is not universally accepted as legitimate and that is really my fault. When I got involved in the Roswell case with the J. Allen Hynek Center for UFO Studies and Don Schmitt, I was spending a great deal of money each month on telephone calls to witnesses and in research. Sometimes the bill was over three hundred dollars. It’s something of a tribute to my wife for never complaining about the costs of the investigation. Well, not much. Anyway, I was at the Center’s Chicago office and while they held a board meeting, they suggested that I use the telephone if I had some witnesses to call. An opportunity, for toll free calls (or rather calls that would be billed to someone else) was not to be missed. I wanted to follow up with several people, one of those being Edwin Easley. Easley was the Provost Marshal at Roswell, sort of the top law enforcement officer on the base. When I had talked with him earlier, he had told me, repeatedly, that he had been sworn to secrecy and couldn’t talk about the events. Much to CDA’s annoyance, he told me that Mack Brazel had been held on base, in the guest house... CDA simply doesn’t believe this, and that certainly is his right. So I called Easley, without benefit of my tape recorder. I was making notes about the various things we had talked about earlier. Then I asked him a question that would, for me, become critical. I asked, "Are we following the right path?" I said, "We think it was extraterrestrial." And then he said, "Well, let me put it this way. It’s not the wrong path." I was so excited by this admission that when we finished our conversation, I interrupted the meeting to tell them what I had heard. 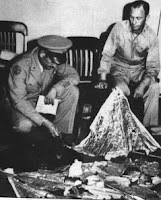 Easley, one of the top officers at Roswell in July 1947 had confirmed that the craft was extraterrestrial, although in a somewhat round about fashion. At that time, Easley, as far as I knew, was in good health. I planned to visit him at his home, video tape a conversation if he would allow it, audio tape if not, and get the discussion on the record. A few months later, Mark Rodeghier, the scientific director at the Center said that he was going to be in Fort Worth and would I arrange a meeting with Easley. I thought this a wonderful idea because it would provide a... well, a different perspective. When I called to arrange the meeting, I learned that Easley was extremely ill. He would die not long after this. An opportunity for corroboration through a disinterested third party had been lost. Now everything hinged on what I had heard, how I interpreted it, and what I had reported. I simply couldn’t prove what Easley had said to me during that conversation. If some wish to reject it, that is certainly their right. Without Easley on tape, his statement can be considered too good to be true and he’s not around to contradict me. Oh, I can point out that other officers in Roswell such as Patrick Saunders, provided some interesting written evidence. There have been some interviews, conducted by other researchers that have tended to corroborate some of this. Joe Stefula’s interview of Chester Barton, one of the officers who worked for Easley for example, suggests that something extraordinary was recovered and that Easley knew about it. But that isn’t the same thing as Easley saying it was extraterrestrial on tape. And to be fair, Barton believed, at least at first, that what had crashed was a B-29 carrying nuclear weapons and not an alien spacecraft. But Barton also said he never got all that close to the debris and the burned areas. He did say he thought the amount of debris field was smaller than would be accounted for in a B-29 crash. Easley’s family, and one of Easley’s doctors, have suggested they heard about the extraterrestrial nature of the crash from Easley. Some researchers have dismissed this, confusing Easley with both Sheridan Cavitt and Curry Holden’s discussions of the crash, attributing to Easley things that were said by Cavitt or by Holden’s family. I mention all this to provide a little bit of a context. These are all things that I know. It comes down to this. Easley told me, basically, that the crash was extraterrestrial and I can prove it to no one. For me, this is important information, but for others, it is not. If I had a tape, then we would be having a different discussion. There are some who said that the very instant that Easley made that admission, they would have gone out, bought a tape recorder and called him back. While I thought about it, I believed, at the time, I would have an opportunity, several opportunities to discuss all this with him again. I did not anticipate his illness. If I had it to do over again, I would have called him the first chance I got and hade him repeat the information. This interview with Easley was important to me... but is not important to anyone else. This is one of the reasons that I have accepted the idea that some UFOs represent alien visitation. Science is often about repeatability which means that what I observe you can also observe. It means that a phenomenon, whatever it might be or how rare it might be, has been observed by others. We can say that a meteor fall is something like a UFO sighting. We can’t repeat them at will but we can interview those who have seen them. In today’s world, we know what meteors are (and do I really need to point out they are of extraterrestrial origin?). But not all that long ago, at the beginning of the 19th century, science rejected the idea that there were rocks in the sky. Yes, there had been meteoric falls, and meteorites, known as thunderbolts, had been recovered, but the idea of a meteor was outside of the science of the day. And it was into the 1950s that science failed to recognize that some craters were of meteoric origin. Many scientists believed them to be extinct volcanos. Although I’ve always though about the craters on the moon having their origin in impacts, that wasn’t always the scientific thought. I bring this up merely to point out that some things in science are not readily reproducible. The observations must be taken where they can be found and often are not made by scientists but by the public. It is the job of those scientists to gather the observations in a detached and dispassionate fashion so that we all can understand what has happened. There has been a level of reproducibility in the UFO field. Ted Philips has been studying UFO landing trace cases for decades. His catalog has some 4000 different cases in it. There have been all sorts of UFO landings in which traces have been found. This would be, of course, the UFO interacting with the environment. 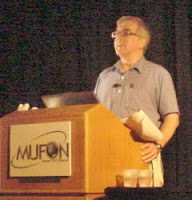 Philips, at the MUFON Press Conference held in Denver in August pointed out that he knew the kind of landing trace he would find based on the witness description of the craft. That, to me, suggested that there was something more than a random nature to the landing traces. It meant there was a predictability here that science would demand. You give me a listing of the object’s characteristics and I will predict the type of landing traces that we will find. There are hundreds of cases in which instrumentality was used as part of the UFO observation. This might be radar, might be cameras, might be other types of sensors but all of it leads to the conclusion that something physical and real had been observed. That doesn’t necessarily mean that it was extraterrestrial, only that what was seen was neither hallucination nor illusion. It might be misidentification but it was real. Another factor weighing in here is how hard the Air Force, and other parts of the government, have worked to conceal information. A look at the Project Blue Book files shows us that these investigations were less than adequate and while they claim that only some 700 reports are labeled as unidentified, about 4000 cases, or one-third, are labeled as insufficient data for a scientific analysis. That means they are unidentified. We can prove that the Condon Committee was designed, not to learn if there was a reason to study UFOs but to end the Air Force involvement in UFO investigations... or rather their public involvement. This documentation exists and suggests, at the very lease, a bit of duplicity. All of this, and many other things, have lead me to the conclusion that some UFOs are extraterrestrial visitors. To me the evidence is overwhelming and convincing. To others it is not. It is a question of what evidence you see and what evidence you believe and what evidence is persuasive. What is interesting here is that both Paul Kimball and Lance Moody can make their points without descending into the nastiness that others employ. Over the years I have been called all sorts of names just because my opinion is different from that of someone else. I have been accused of all sorts of things from being a government agent to being a liar and a coward, simply because I disagreed with someone’s analysis of a UFO case or bit of evidence. But that doesn’t make them right and me wrong. It only makes them nasty. So, to Paul and Lance, I say, we disagree and I believe the evidence is overwhelming. I say, I am satisfied by the evidence I have seen and the witnesses I have interviewed. If you find the evidence to be insufficient and the witnesses less than believable, then that is your right. I am hoping that someday we all can find the evidence we need to prove our points... (And yes, I understand that we approach from opposite directions and if I am right, they must be wrong and if they are right, then I am wrong). And for those out there who wonder about this, I have changed my mind when the evidence warrants it. I believed Frank Kaufmann until we had the evidence that he was not being candid. It is one thing to reject his testimony because you know that there has been no alien visitation and therefore he must be lying and another thing to reject it because the evidence suggests he was lying. We will continue to march here, providing information as best we can (and that would be the editorial we which means, of course, me). As new information appears, it will be published, regardless of what it is. I hope that we can leave the nastiness aside and continue to discuss all these phenomena intelligently, rationally and civilly. As a final thought... if those who wish that the old geezers would get out of the way, I say this. Buy my files, records, tapes, microfilms and photographs for one million dollars, meaning that after taxes are paid, I have one million dollars, and I’m gone. I won’t write anymore UFO books, I won’t appear at anymore conferences or symposiums as a speaker, and I will take down this blog. Then you youngsters can have the open field. Just let me know when you have the money. (Blogger’s Note: The last time I addressed the Ramey Memo, we had the most comments ever to one of the postings... I was a little disappointed that the tone, at times, became more combative than I care for. I had tried to word the post in an inoffensive way, but there are always those who take offense at almost anything... When my mother died, I was the sole owner of one of her bank accounts but knew her wishes. I sent checks to each of my siblings including step. Imagine my surprise when one of them, getting a fairly nice check unexpectedly, complained about it. I mean, you open the mail and a check drops out and you’re annoyed... but I digress. My point here is that I am again addressing the Ramey Memo in an article that Barry Greenwood published in the September 2009 issue of his UFO Historical Revue. I publish it without comment, other to say that it offers a new and interesting interpretation on one of the lines of the Ramey Memo. After a lull in interest, there has been a recent renewal of discussions about the "Ramey Memo" on Internet lists. The usual banter was swapped as to whether or not the document (as I will call it from here on as there is no evidence that it is a memo) is a top-secret message regarding Roswell aliens or merely a teletype taken from a newspaper office in Fort Worth, Texas. For those unfamiliar with the Ramey document, it is a folded piece of paper held in the hand of Brigadier G eneral Roger Ramey, head of the 8th Army Air Force based at Fort Worth, Texas (See photo). On July 8, 1947, photographs were taken of Ramey, his chief of staff, Thomas DuBose and Roswell AAF officer Jesse Marcel Sr. by J. Bond Johnson, a Fort Worth Star-Telegram photographer, in response to an AAF press release that the debris recovered from the alleged Roswell UFO crash was a weather balloon. The debris itself was displayed in an office for Johnson to photograph, which he did and his pictures were widely distributed the next day in national newspapers. One can see in photo prints that the document being held has lines of text at theedge of visibility. Attempts have been made over the years to enlarge that portion of the photograph. The text however remains at the extreme limit of resolution. A few words do seem to be visible, asserting the document’s relevance to the Roswell incident, but little else is clear. Readers of UHR (UFO Historical Revue) will recall that I dealt with this debate in the March 2004 issue, titled, "An Observation on the Ramey Memo." In it I offered the possibility that the document showed signs of being a teletype dispatch, typical of a news wire taken from a newspaper office rather than being a military/government ocument with details of the recovery of an exotic machine possibly from another planet. Not surprisingly some Roswell proponents of the extraterrestrial notion reacted with anger. Nevertheless, it didn’t seem that there was any hard consensus beyond a few words as to what the document said. On August 26, 2009, it was a hot summer afternoon. Not much could be done in the heat so I sat for a while to stare at a blow-up of the Ramey photo to once again take a try at picking out words to recognize. This had become a regular part-time activity for some UFO researchers since the photo was enlarged years ago (See the enlarged area below). The possibility of revealing sensation evidence of UFO reality and government cover-ups through this document was irresistible for those who have been involved in such research for decades. All one had to do was decipher the distortions and blobs that characterized the text. For my part, in between stares I pulled old clipping volumes of Roswell coverage to remind myself of the reporting on the story for July 8-9, 1947. I tried running the picture through a variety of Photoshop computer enhancements by brightening or darkening the image. It was to no avail. "How would anyone ever get this mangled, messy text deciphered," I thought. It seemed unlikely that muck could be enhanced! Wasn’t there anything better to do on a nice summer day? Getting a little weary I noticed a cardboard pair of 3-D red/blue glasses from some leftover movie I had once seen hanging from a holder above my computer screen. Looking at it I said, "Oh, why not." The idea of using them seemed rather pointless, as I was not even looking at a 3-D picture. But nothing was being accomplished otherwise. I put it on. Oddly enough using the 3-D filters somehow injecting a small amount of clarity into the image, much like a pair of yellow sunglasses, (as has been advertised on TV) seems to make the landscape much clearer. It was certainly not enough to make the blobs more readable but it was enough to make patterns stand out more. I focused upon the portion of the Ramey document that seemed to be a little clearer than the rest. It is an oval area on the left side of the text, a short distance from the right side of Ramey’s thumb that obscures part of the document’s text . A few words like "…AT FORT WORTH, TEX." and "…THE ‘DISC’.." seem to stand out enough to gain a general consensus as to these decipherments. On the next line down where "THE ‘DISC’" seems apparent, what I will call "line 5" out of the total of eight lines visible on the image, the previously mentioned oval area of visibility had text a bit easier to read, that I attribute to that part of the document perhaps being a little closer to the camera lens by means of its appearance of being held in a rumpled manner by Ramey and folded in an arch toward the lens. I kept looking with the 3-D filter and noticed a pattern, a pattern that seemed familiar. But before I continue, a bit of explanation is needed about the length of words. To check their letter lengths, I used "letter stacking." The lines of text formed on a machine, like a teletype or an old typewriter, have regular spaces between letters, words and lines. With letters poorly focused and defined, making them virtually unreadable, the number of characters in each word could be measured by running a straight vertical line from the centers of letters above and below the line in question to the centers of letters of the words in that line. It is like placing a grid over the page and counting the letters and spaces that give your word length. It can even work when the page of a piece of paper is curved in the manner that can be seen in this document. With this in mind, and a 3-D filter at the eyes, a pattern was noticed. The second word in line 5, a six-letter word, gave the strong impression of ending in "GHT." Thinking this was an artifact of the 3-D filter I took it off and looked again. The impression was still there. A six-letter word ending in "GHT" didn’t make much sense. "SOUGHT," perhaps? But the article was supposed to be about something that was already found. But then I recalled one of the clipping volumes. Having just previously read clips in between pondering the photo, I went back and flipped through it again. There was a press clip from the San Mateo CA Times of July 8th. Late edition papers for the 8th had carried the breaking Roswell debris news. Reading down the clip I saw this: "Lt. Warren Haught, public information officer at Roswell said…." And the quote continued to his press release. "HAUGHT" stood out like a sore thumb. It was a six-letter word with a "GHT" ending in an article related to Roswell. As long-time Roswell pundits notice here, "Lt. Warren Haught" should actually be "Lt. Walter Haut," the "PRO," or Public Relations Officer, at Roswell Army Air Field. The press had butchered Haut’s name, probably in the rush to publish news about Roswell. In the first rush of publicity after Haut sent out a press release on the recovery of a flying disc, the base and Roswell media were bombarded with phone calls from world media about the story. Most certainly, one or more wire reporters heard Haut’s name and spelled it phonetically, not even getting the "Walter" right. In the Ramey document, we don’t see the word "WARREN" clearly in the text. But through letter stacking I’ve determined that the area before "HAUGHT" is a six-letter word and, based upon the use of the word "HAUGHT" in the press coverage, "WARREN" is the most likely fit in that area. Line 5 was beginning to fall together in a sensible fashion. I looked at the rest of the line. It was obvious that there was a comma after "HAUGHT," then words and punctuation of the following lengths appear: six, nine, seven, two, seven, comma, four, period. I compared the San Mateo Associated Press (AP) extract with the letter counts, verified through the letter stacking. To my astonishment all the words matched, except for one. The nine letter word. "Information" in the article didn’t seem to fit, being eleven letters long. What else could fit "public (blank) officer?" "….WARREN HAUGHT, PUBLIC RELATIONS OFFICER AT ROSWELL, SAID." The photographer, J. Bond Johnson, originally said that he took a flash AP wire dispatch about Roswell from the teletype machine at the Fort Worth Star-Telegram and brought it to the office where the debris was to be photographed. He had said that he handed the dispatch to Ramey before the pictures were taken. Johnson later recanted on this testimony when he became involved with a group called "RPIT," or "Roswell Photo Interpretation Team." RPIT had concluded, among other things, that the debris in the photos showed evidence of symbols like ancient Egyptian glyphs on the foil-like material, that beams had symbols in bas relief that were possibly made of ceramic material. How a ceramic material could be deduced from a photo is a mystery but no less odd than the other RPIT conclusions. Johnson responded to the question of his contradiction as to whether or not he handed General Ramey the document by only saying, "Obviously, I was wrong." It is not that obvious why he was wrong! It is also important to note that when dealing with journalistic teletype messages, they send long text, short text or fragments of information that later can be refined and rewritten. They don’t necessarily go into the finished product, a newspaper article, exactly the way they came off of the wire. Unless one has the exact original "flash" message from a particular wire teletype machine, it can be difficult finding a perfect match of lengthy text to something like the Ramey document. Context is all-important too. One might be able to see shapes in the letters that resemble, but don’t exactly look like, the letters they are supposed to be. Words can be seemingly deciphered, but unless they fit into a meaningful sentence they can’t account for much understanding. The key determination in this finding is the word "HAUGHT." It is reasonable to see the shapes of these letters in both the raw and enhanced versions of reproductions of the document. "Enhanced" does not mean that words were altered in any way. The document is bad enough for those with good eyesight, very difficult for those without it. So darkening of the text is an aid to seeing the letter shapes better. But what if this reading isn’t correct? Let’s say I am just employing wishful thinking in seeing the "GHT" at the end of the six-letter word? Then there is no case. I have tested the interpretation on others who have agreed that the Ramey document word does appear that way. A critic might say, "So, just friends trying to please you!" I decided to consult the website of the most ardent booster of the Ramey document as supporting Roswell as a flying saucer crash with alien bodies, David Rudiak. He once referred to my writing on the Ramey document as "totally bogus." Rudiak examined thirteen versions, including three of his own notions, of what other researchers believe the Ramey document says. Looking at line 5, five versions agree with "AT ROSWELL." One agreed with the word "SAID" at the end of the line. One (Rudiak) agreed in an early interpretation with "OFFICER," but later changed it. One agreed with "PUBLIC." No one had "RELATIONS," surely a difficult read being in a fold in the paper and without other context yet deciphered. One person interpreted "GHT" as "SOUGHT." Most importantly, Rudiak himself saw the "GHT" but believed it to stand for "WRIGHT," as in Wright Field, Ohio, where the Roswell debris was supposed to have been taken. But Rudiak couldn’t construct a smooth flowing sentence out of it. In all cases, the interpretations made little contextual sense as they built broken phrases, or the letter/space counts fit poorly. Bogus is as bogus does! Let’s ponder all this here. I’m trying to think of a good reason why "WARREN,HAUGHT" would appear in a classified, top-secret government teletype about flying saucers and alien bodies being picked up and shipped to other government facilities. We have what pro-Roswell-as-ET advocates claim is the most top secret event in U.S. history, classified on a par with, or above, the H-bomb (if you accept the Canadian Wilbert Smith memo of 1950). Yet in what is supposed to be one of the earliest official bits of documentation on the secret, it draws on information from a public relations officer at Roswell instead of intelligence information on the debris, bodies, technology or whatever other science could be involved. And it then proceeds to badly mangle both of his names! Would the military not know the names of their own personnel in top-secret messages? Worse still, would they rely upon a known journalistic error, leading to the absurd situation of U.S. Army Air Force intelligence depending upon the newspapers for part of its information on its own personnel along with the Roswell event? It is absurd. Then why is Walter Haut’s mangled name in the supposedly secret government document? Given the context of line 5, it appears that the document is depending upon information from "WARREN HAUGHT" as a source to be read. Why would this have to be in a classified teletype when it could be read in the newspapers? And what would he have to tell military intelligence needing to be classified top secret that they don’t already know about the alleged crash: to which newspapers he was sending his press release? There is a great deal about this that doesn’t make sense if the Ramey document were a classified message. Line 3 of the Ramey document has a phrase "…AT FORT WORTH, TEX." The words "..THE ‘DISC’.." with DISC in quotes appears on line 4. The phrase "…WARREN HAUGHT, PUBLIC RELATIONS OFFICER AT ROSWELL, SAID." is the best reading of line 5 of the text because the word count, letter count, punctuation and meaningful context fit and make sense. It is very likely that this phrase refers to the text on line 4. All can be shown to come from journalistic news accounts rather than from military/government documents. If you do not think this interpretation is fitting, I offer a challenge: have line 5 make grammatical sense with different letters, words and phrasing. Much credit is due Mary Castner, Victor Golubic and Joel Carpenter for valuable computer assistance and comment. According to the newspaper account that appeared in The Welland Tribune, dozens of people in and around Ottawa saw something flash across the sky and smash into the river. They heard an explosion that was described as thunderous. Witnesses said that the object appeared to change course a number of times and that there were lights on it rather than it glowing. Some thought it might have been a small aircraft in trouble and because of that, emergency search and rescue crews began to probe the river with sonar and underwater cameras. A doctor, Dirk Keenan, who was out sailing with friends said that the object was a very bright light in the east, close to Quebec. He thought it was like the headlight of a car that was descending rapidly, leveled off, and then disappeared. On the next afternoon, about 1:30 p.m. the police and rescue workers located an object about thirty feet below the river’s surface. The current prevented divers from entering the water. A police spokesman told reporters that the size and shape suggested it had not come from an aircraft and that it could be a rock or logs stuck together and that no one had come forward with any sort of photograph or video of it though there might be a reason for that. Some claim that the video footage had been confiscated bu authorities. To this point it isn’ know if the object found under water is the same as that people reported or something that has been there for a long time. No aircraft were reported missing and it doesn’t seem that this was a piece of terrestrially launched space debris. In other words, this is the classic unknown. But it turns out that one of the newspaper stories mentioned Chris Rutkowski, a UFO researcher in Canada, that I know. So I asked him what he knew about the case. He wrote that, "I can tell you what I know about the Ottawa ‘crash,’ although I’m not convinced anything really crashed!" He said that he had called the MUFON representative in the area, but she hadn’t interviewed any of the witnesses. He said that some people who had seen the police searching the area stop the search after the mass was located, and some of them thought a cover-up was now in place because there was no new information. There was speculation that the US, here meaning the CIA I suppose, was now somehow involved, though Rutkowski didn’t subscribe to those ideas. He wrote to me, "From piecing together what info I have, here’s what I think happened: Lights were seen in the sky and loud booms were heard along the Ottawa River. I spoke with a reporter, and he said that it was his impression that the lights were seen ‘towards’ the other side of the river from where the witnesses were located. (It’s a very wide river at that point.) I do not think anyone saw anything ‘crash’ or (more likely) ‘splash’ into the water. It was assumed that falling lights must have been on a falling object and that since the rive was in that direction, whatever was falling must have fallen into the river." Rutkowski did learn that some people had been setting off fireworks that might well account for the booming because sound carries well over water. He didn’t know what the object that had been detected was, writing, "Who knows? A car? Jimmy Hoffa? The Ottawa River is like the one that flows through my city, and they’re always pulling things out of it." Rutkowski said that the key would be to find the two witnesses who might have seen the lights smashing into the water. "Until then, we have no convincing evidence that a UFO crashed in Ottawa on July 27th."